The results of painstaking and meticulous academic research do not always make thrilling reading for the non-academic. The documentary evidence that provides the basis for this book, however, is by turns amusing and enlightening, and always entertaining. The skilful workmen of Deir el-Medina excavated, designed and produced the superb tombs in the Valley of the Kings. They were an educated and articulate society, capable of standing up for their rights to the representatives of the palace, including the vizier, who oversaw their work. Some aspects of the lives of the artisans are surprisingly liberal even when compared to today's standards. They were allowed official leave of absence for a variety of reasons, including brewing beer (and occasionally, for being hungover), as well as for dealing with family problems or disputes. They were given compassionate leave to attend funerals and sometimes abused this right. On one occasion, the author notes, the list of official absentees included a man apparently on paternity leave: "Ka-sa, his wife being in childbirth.. ..had three days off". Many of the texts from Deir el-Medina were written on ostraca, pieces of limestone or broken pottery. They were thriftily used for letters and for practising writing. These have survived in their thousands because they were all eventually dumped into the huge pit that is a prominent feature near the village. The village had no water but that brought in jars on donkey-back from the Nile, and the pit was dug in a fruitless attempt to find a water source. It is from documents such as these that we learn about the love charms and spells cast by lovesick village lads and lasses, and what happened when it all went wrong. One letter tries desperately to convince a man that his wife is being unfaithful. "I, did I not take you aside to say, you should look to what you will do about your wife, and to say you are blind about her! Look, I will make you see this continuous fornication which your wife committed against you." There are sad stories of brutal husbands and neglectful children: "I raised these eight (children) and I outfitted them with everything that is usual for people of their character. Now look, I have become old, and look, they do not care for me." One man attempts to move in with a woman, taking all his belongings with him (1 smooth cloth tunic, 2 pairs of sandals, 1 jar of fat, one headrest and so on) only to find that the woman and her family want nothing to do with him. Not put out at his failure to achieve the ancient equivalent of getting one's feet under the table, he tries again: "Look, she acted exactly the same way again!" - Those who already have some knowledge of the lives of the workmen of Deir el-Medina will enjoy the further detailed insights provided by this book. Those who are new to the subject will benefit from the well-written and illustrated introduction and enjoy the lively commentaries. 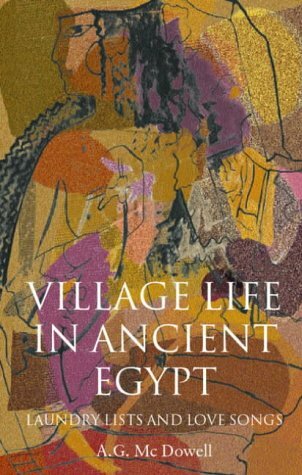 "Village Life in Ancient Egypt: Laundry Lists and Love Songs" by A.G. McDowell is published by Oxford University Press. 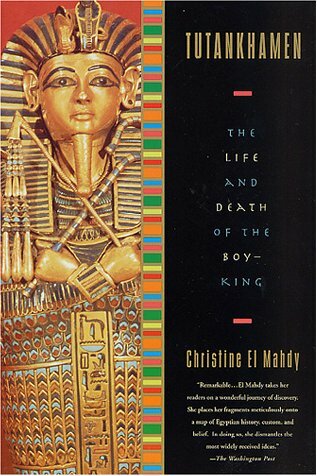 The first part of this book, describing the discovery of the tomb of Tutankhamun and the famous characters involved, is more interesting than the conclusion. Written in an easy-going style that encourages the reader to become involved with the (well-known) story, it reveals fascinating goings-on behind the scenes and the different, often volatile characters involved in Egyptology in the 1920's. The Foreword, however, has prepared the reader for something special in the way of revelation about Tutankhamun, and I am not convinced that the book delivers this. Many books about Tutankhamun actually concentrate on the period before his reign when Akhenaten ruled from the City of the Aten, Akhetaten. Christine El Mahdy herself points out that millions of words have been written on the subject. This book is no exception, but it chronicles life in Akhenaten's city in a vivid way that does keep the attention of the reader. The issues relating to Akhenaten's life and theories are discussed in a clear and lucid fashion. Some of the ideas subsequently dismissed by the author are, I feel, somewhat out of date anyway and anyone with some knowledge of the subject would be well aware of them. It is a bit disingenuous not to mention Kiya, Akhenaten's other known wife, until page 267 and again, anyone with some knowledge of the subject would guess that the conclusions might have something to do with her. Christine El Mahdy provides additional supporting material for her importance and comes up with some interesting ideas on her origins. 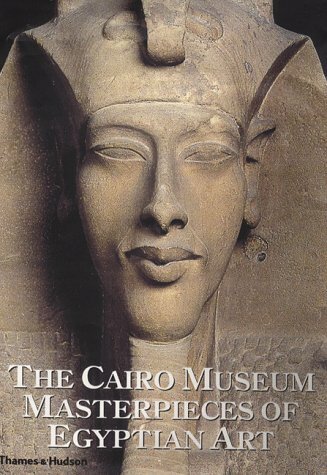 The writer has an appealing style: "You may even see the faces of the great pharaohs in today's Egyptians. A replica of Ramesses II may shine your shoes; Seti I may serve you coffee. It has happened to me!" "The linen still lies in folds where someone placed it 3000 years ago; dried-out dishes of pigeon casserole still fill bowls that some chef served 4500 years ago; and the paint on the ancient tomb walls seems so fresh that, if you touched it, you feel sure that it would smudge." The book is very well illustrated but I did find the absence of transliterations with the hieroglyphs a little annoying. There is a translation to accompany each one, but I feel that people with little or no knowledge of the subject (Ed. Are there any?) who would benefit most from this book, would like to have a transliteration as well. Tutankhamun exerts a perennial fascination and there is no doubt that there will always be room for another commentary on his life and death. This vivid and lively account will find its way onto many bookshelves. Professor Kent Weeks has an approach to his subject that might be considered irreverent by some. I thoroughly enjoyed this book and suspect that it will provoke extreme responses one way or the other. Like it or not, the discovery of the huge tomb of the sons of Ramesses II, KV5, is one of those dramatic events that captures the public attention, and since the world first heard about it in 1995, interest has scarcely died down. The style of the book is relaxed and inclusive. Weeks knows how to tell a story, whether his own or that of the tomb. He brings the daily headaches of excavating in the Valley of the Kings to vivid life and his gift for dialogue suggests that should he ever wish to leave his chosen field of Egyptology (unlikely) he could always find a place as a novelist. I suspect that his efforts would leave the best current competitors in the field of Egyptological fiction standing at the blocks. Here's an example: "'Wata-weet!' Nubie shouted the Arabic word for bats. They will get stuck in your hair! I hate them!' He rolled over and lay facedown on the ground, covering his head with his hands. It took several minutes before things began to quiet down. Not all the bats had left the tomb by any means, but several thousands of them had, and the air was thick with the stench of the fine dust they had stirred up." When it comes to the archaeological detail, Weeks writes just as vividly. "Gently brushing, blowing and cleaning with various solvents, Lamia removed much of the salt that covered the walls, reattached precariously hanging bits of plaster, and cleaned their painted surfaces. Hovering over us as we cleared debris away from the wall, Lamia quickly stepped in to stabilize wall sections as we exposed them. It was all done slowly, a square centimetre at a time..."
Treatment of the savage attack on tourists and guides at Deir el-Bahari is equally as vivid, and the genuine, stunned shock of both archaeologists and locals has the absolute ring of truth about it, for anyone who is a regular visitor to Egypt. "This whole affair was tragic not only for the tourists and their families, but for the people of Luxor, whose constant refrain, 'No Egyptian could do such a thing, it must be a foreigner,' gave way to shock and tears when they realized that the incident had been the work of their countrymen." The strong sense of personal failure to protect the "honoured guests" of Egypt comes through clearly in the words of one of his workmen. No book could deal with such a sensitive subject easily, but Weeks has refused to avoid the issue and has given us his own experience of it with honesty and clarity. 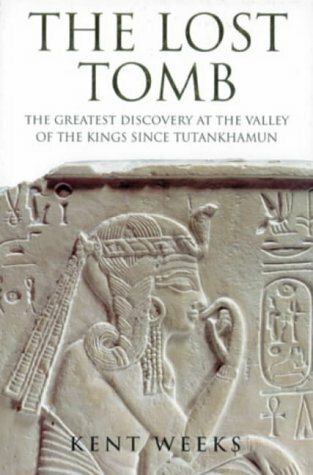 This is a book that tells the truth about excavating in the Valley of the Kings vividly and clearly. That it is also the work of a good storyteller is just an added bonus. This collection of choice pieces from the Cairo Museum has already been described by various reviewers as "sumptious" "unrivalled" "exquisite" and luxurious", leaving the latecomer to the field with a limited choice of adjectives. The Italian team that worked on the 3lume has succeeded in capturing and surveying that most enduring quality of Egyptian sculpture: its ability to summon p the personality and life of long-dead individuals. The gold mask of Tutankamun exhibits this ability to such an extent that it is a cliche. The same quality comes through clearly in numerous less ell-known pieces including the wooden statue of Auibre-Hor. Breath-taking and atmospheric, le photographs in this book bring the observer in personal contact with the items in a way that proves the enduring appeal of photography. New technology will have to work very hard to produce images of this quality, which are the result of skill, patience and a genuine 3mmitment to empathising with, and resenting, the talents of ancient artists. In the beginning there was "Gardiner's Egyptian Grammar". It had much the same effect on a new student of Egyptology as does a veterinary-sized hypodermic syringe on a nervous patient at the doctor's. Then came the Egyptology publishing sensation of the 1990's: Collier & Manley's "How to Read Egyptian Hieroglyphs", with 30,000 copies sold within a few months. It was everywhere on my latest journey up river. The immense amount of time and effort needed to produce this book are amply rewarded by the enthusiastic response from its users. The hieroglyphic text setting by Nigel Strudwick rightly receives a special commendation in the introduction. Typical comments from students were "This book gives one hope" (from one with active memories of Gardiner) and "My heroes!" (from one who had been studying hieroglyphs for some time). Part of the success of this book is due to its concentration on texts on monuments, principally stelae, in the British Museum. It's a practical guide, and the users gain an immense sense of achievement from being able to look at an inscription in context and translate even part of it. It helps that some of the opening formulae involved in these funerary items are recurring, and can be quickly spotted by the student. 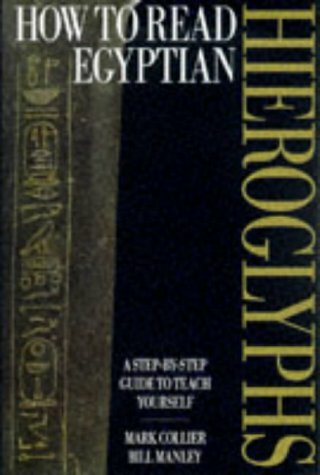 Secondly, it is based on the authors' own experiences of teaching Egyptian hieroglyph courses around the UK. They draw on knowledge of the problems faced by ordinary students who have a real desire to learn but no previous experience of the subject. "How to read Egyptian hieroglyphs" may well encourage students to move on to more academic texts. It will certainly encourage future studies. Finally, the book introduces some of the people of ancient Egypt to the student. It is through funerary inscriptions that we learn of their aspirations and ambitions and sense of pride in their achievements. We learn, too, of their hope for continuance. Beyond the formal language and complicated religious thought lie simple aims: to be remembered as a good person, one who achieved things and was successful in life, but who cared for others; and a belief that the happy life in Egypt would continue after death. It seems as though every year some tabloid or other - and the occasional broadsheet - has recourse to a list of the most popular names for girl and boy. Will Jack have overtaken Oliver, will Emily have beaten Tamara, will Damon overtake them all and is Wayne on his way out? This list is for all of you who have ever sighed "not again". There are seventeen "Amen" related names, including Amenherwenemef and Amen-herkhepeshef, both of which were good enough for Ramesses II; alternatively you could choose Bakenrenef, "he is the servant of Re", Nakhthorheb, "Horus rejoices in strength", or Pedebastet, "WiseoneofBastet". As well as the names, their structures and suggested meaning, there is a useful breakdown of the elements of names and their interpretation at the end of the book. You never know - it might catch on and Narmer (here the suggested meaning is "Angry Catfish") make it to the top ten. 450 Egyptian Names - their meanings explained by Jo Hirons is published by Blue Lily Press. The House of Horus at Edfu, Ritual in an Ancient Egyptian Temple by Barbara Watterson is published by Tempus Publishing Ltd.
temple was central to Egyptian life, it was not a centre of worship for ordinary people. In principle, only the most senior priest of the temple had access to the inner sanctum where the god dwelt. The strict order of temple ritual had to be adhered to, lest disaster overwhelm Egypt. The visitor to modern day Edfu is often overwhelmed by the thronging traders and carriage drivers who jostle with tourists. The site of the temple is one of the busiest in Egypt. However, given the opportunity, this would be an ideal guide to take round the site at a leisurely pace, examining each of the scenes and inscriptions in turn. The high point of the ritual year was the celebration of the marriage between Horus of Edfu and Hathor of Dendera. It was one of the few occasions on which the ordinary people of Egypt could participate in a festival of a state god. A barge carrying a statue of Hathor sailed upstream to the temple of her husband accompanied by singing and dancing, music and drinking. In contrast, the temple was also the site of a ritual performance in which Horus overcame evil in the shape of a hippopotamus, a creature of chaos associated with the god Seth. The reliefs show the sequence of action much as might appear in a cartoon strip, with the hippopotamus gradually being vanquished and growing smaller and smaller. The temples were great economic centres too, providing employment for specialist staff in the service of the gods. Garland makers, singers, dancers, cooks, incense manufacturers and textile workers all owed their livelihood to the temple. This tour of the Edfu temple, with detailed explanations of the scenes and inscriptions, is a must-have for serious students of Egyptian temple ritual.